Ricky Rock and Overtaker By Sib won the two main events at the Marsa Racetrack yesterday. 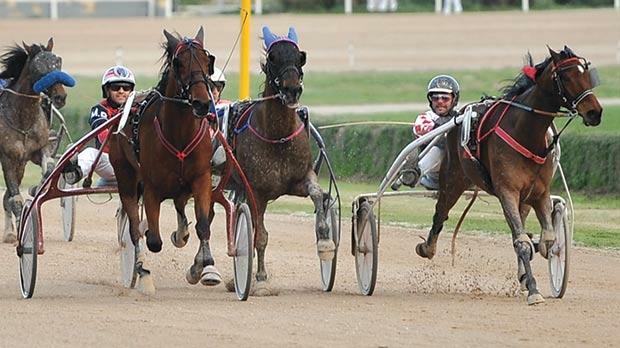 These were races reserved for Premier Class trotters in the fourth meeting of the year. The programme comprised 10 races, all for trotters, on a long distance of 2,640 metres. Fourteen horses lined up for the first Premier Class race on the card. Ricky Rock, under the charge of veteran driver Frenċu Cassar, stormed ahead with a lap to go and opened a slight lead from Quo Williams (Charles Camilleri) and Jaguar Ruda, the latter driven by Anton Cassar, Frenċu’s son. Ricky Rock never relinquished its position and went on to easily see off the challenge of Quo Williams in the home straight. Ourasi Diams (Emmanuel Fenech) and Princess View (Julian Farrugia) finished third and fourth respectively. Ricky Rock clocked an average time of 1.15.2” per kilometre on the way to claiming its first win in Malta. The second Premier Class race was contested by 13 trotters. Italian favourite Overtaker By Sib (Marco Refalo) was the fastest trotter in the initial stages, opening a small lead from Quiet Du Chene (Mario Fenech) and Wee Catch Diamond (Julian Farrugia). With 300 metres remaining, Overtaker By Sib was still going strong but in the final strides, it had to go all out to stave off the challenge of Quiet Du Chene (Mario Fenech) and Quillian Joyeux (Andrew Farrugia). Overtaker By Sib sealed its second win in a row in an average time of 1.15.5” per kilometre. Rickshow (Charles Camilleri) placed fourth. The other races on yesterday’s card were open for horses in the Silver, Bronze and Copper Classes. In the first Silver race, Belgian newcomer Unika Slipper (Cliferty Calleja) dashed strongly from the outside 400 metres from the finish line. This eight-year-old mare secured its maiden win in Malta by more than two lengths from Natieu d’Echal (Julian Farrugia) and Sandro Du Vivier (Paul Galea). Another debutant, French Ukal Joe (Michael Sultana), was fourth. The early leader in the second Silver Class race, Nitesco d’Antony (David Ellul), ran out of steam when the front horses turned for the final straight. This French trotter was surpassed by Rubis d’Olivier (Noel Baldacchino) which obtained its first win of the year from Suro Du Cornillet (Julian Farrugia) and Sitka Rod (Tony Demanuele). Herzbrecher (Rodney Gatt) followed home in that order. Another meeting is scheduled for Sunday with the first race starting at 1.30pm. Race 1: Copper, Alana (Marvin Cauchi) – 1.19.7”. Race 2: Bronze, Voila Dry (Ivan Bilocca) – 1.17.5”. Race 3: Copper, Count Wiesnievski (Anton Pace) – 1.19.6”. Race 4: Bronze, Tanja Dilli (Noel Baldacchino) – 1.18.6”. Race 5: Bronze, Akemi (Redent Magro) – 1.18.6”. Race 7: Premier, Ricky Rock (Frenċu Cassar) – 1.15.2”. Race 8: Silver, Rubis d’Olivier (Noel Baldacchino) – 1.17.3”. Race 9: Premier, Overtaker By Sib (Marco Refalo) – 1.15.5”. Race 10: Bronze, Sibenik (Paul Galea) – 1.18.7”.